Don't blame wolves for elk hunting woes Tar sand mining is actually coming to Utah? It’s not true, and on Monday the U.S. Senate will vote on his amendment that would lock in the noise for a lot more time, according to the Sierra Club. Of course you would be wise to do your own research, but below is the Sierra Club alert on this. March 23, 2010. Update: McCain drops his amendment. Arizona Daily Sun. Timeline: The Senate votes on the destructive McCain Amendment MONDAY AFTERNOON. (may become part of FAA Reauthorization Bill unless blocked). Discussion and voting all afternoon and into evening on FAA bill. The Facts: Yes, we have waited since 1987 to get a good management plan for the Grand Canyon. The Park Service has completed the new plan and is ready to release it in April, in just a few weeks! McCain’s ‘midnight rider’ amendment is a gift to the air tour industry. Together with the Nevada senators, he is back-stabbing the Park Service just when they have completed their work. McCain’s amendment would legislate existing noisy conditions and stop progress. The McCain amendment is a direct attack on Grand Canyon National Park on behalf of the commercial air tour industry. During the 1987 Senate floor debate, McCain said “When it comes to a choice between the interests of our park system, and those who profit from it, without a doubt, the interests of the land must come first.” We think this applies in 2010 as it did in 1987. Please Help: Call Monday, and/or the weekend. E-mail your Senators now. Ask to talk to a live person and tell them that the Overflights Act amendment is 1) destructive to the Grand Canyon, and 2) unnecessary because the Park Service is ready to release the draft environmental impact statement that will present the preferred management plan, and 3) cuts out all those who love the Grand Canyon from having their say. Please also call or e-mail Senator Mark Udall (202-224-5941), chair of the National Parks Committee, with the same message, thank him for his efforts underway to block or modify this dangerous amendment. 3/22 Note: McCain withdrew his amendment. Thanks everyone! I’m no fan of motorized recreation in any form, but when I did my 18 day private Grand Canyon raft trip in 2002 I don’t remember aircraft noise being an issue. Aircraft noise isn’t likely to be a problem in the inner gorge. It is noise on the rims and the various levels above the inner gorge where you can hear it. I’m surprised he came out of the bank bailout of the 1980’s (the Keating-5 thing) unscathed enough to stay in office then. Now he’s just a grumpy old fart who is ominously dangerous to his constituents. “Tweedle deedle drazzle drome, time for this one to go home”… As Mr. Wizard Lizard would say. Salle: That was one of the most pointless rants I’ve seen on this site. But then again from what I read on this site anyone who wears a cowboy hat, and now red high heels, must be worthless and an enemy of nature. I’m not too partial to shiny black shoes so please find someone you don’t like that wears them so I too can join the “conservationist against certain kinds of fashion” club. So is anyone going to help on this alert, or do they want to talk about politicians? I have every intention of making calls to all of those mentioned above as well as the upper echelon of the Interior Dept. I had to go to the city to get some provisions today and just returned. I wonder if there are any live people that can be reached at this time of day… In the morning, I suspect my chances would be better. My rant above was just mt two cents about the good senator’s history and what an appropriate representative he has proven to be in the past. As a former resident of Grand Canyon Village I will certainly be on the phone! I just came out of the canyon (Hermit Area) yesterday, and have hiked the canyon for 20 years many times a year. Noise is a problem in the Hermit and the Boucher Trails areas.. yes you can hear them even at the river. They go overhead at least every 10 minutes on a busy day. It is like a war zone. They are also a problem in the Nankoweap Trail area with the same frequency. Definitley not a wilderness experience in these trans canyon flight zone areas. The more commonly used cooridor trails (Bright Angel and the South Kaibab) and the Grand Canyon Village area with it’s hotels and shopping (and the majority of the 5 million visitors a year), are not tour helicopter flight zones, or there would be more people complaining I’m sure. I spent a month camped at Boulder Beach Campground on Lake Meade this winter. I was assaulted every day by the noise from groups of helicopters transporting tourists to the Grand Canyon or to Hoover Dam. They start at dawn and continue all day. McCain’s amendment is particularly offensive given the passing of Stuart Udall, one of the founding figures of environmentalism and public land defender. Sent to his AZ headquarters today. I am writing to show my displeasure of a new bill you are backing to increase air touring traffic in the Grand Canyon area of our state. As some one whom off roads and goes to remote areas, I am finding it hard to locate an area that is quite and pristine in Arizona. 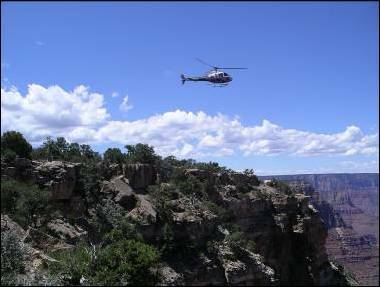 the noise is 24/7 from the small planes and helicopters that fly the Grand Canyon area every day, and the surrounding areas are also effected. As I hike and try to enjoy the wild life and lands what do I hear? Engine noise and shadows on the land by small tourist planes. I ask you to please not allow any more planes in our GC area, even to stop the ones there would be great! The best way to see it is on foot, or on a mule. Please reconsider your yes vote on this bill. The rich can walk just as easy as the rest of us, and they may really get in touch with nature from a hike, rather than flying over the canyon for an hour glance. I’m pleased to report that McCain pulled the amendment after Bingaman gave a great speech in opposition to it. Thanks to all who called their Senators. Great news! Thanks RL Miller. Yahoo! glad McCain did something right for AZ for a change! thanks for the good news! He only dropped it due to lack of support. I noticed that Senators Kyl and Reid were co-sponsors of this ridiculous amendment. I sent letters to every member of the NP subcommittee as well as my Senators. Only one of my state Senators replied with a totally clueless response that proved he never read what I had to say and didn’t even approach the topic I wrote to him about. Good thing he’s not on that committee. What a ruse.